For the past eight years BMW has won the 2.5- to 3.0-liter displacement category of the International Engine of the Year Awards, but Porsche has put an end to BMW's reign with their new 2.7 liter flat-6 motor out of the 981 Boxster and Cayman. The judges loved the fact that the Porsche motor made over 100 HP per liter and were also blown away by this motor's overall efficiency. Welcome to the July 2013 edition of Steinlifters, the online newsletter for members and friends of the Milwaukee Region, Porsche Club of America. 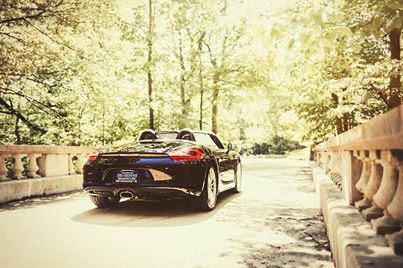 We hope you and your 356, Speedster, GT2, GT3, Carrera 4S, Targa, 924, 968, 928, Boxster, Boxster S, Cayman, Cayman S, Panamera, Cayenne...well, you get the idea ... are enjoying these welcome days of sunshine and warm weather. We have several events coming up that you will enjoy. July 11 - Board meeting. Members are always welcome to attend. 6:30 p.m. Milwaukee Yacht Club, Lincoln Memorial Drive at Milwaukee's lakefront. July 14 - Autocross at the Fair Park. Details here. July 20 - Road&Track concours d'elegance in Elkhart Lake, Wis. Join us for a group drive to Elkhart Lake and an optional dinner at a great restaurant. RSVP required if you plan to join the group for dinner. July 13 is deadline if you plan to join us for dinner. Details here. Aug. 3 - Picnic. RSVP by July 31. This is a casual event in a nice setting. Plenty of parking. The picnic committee has a great menu -- all American BBQ -- and the price is right. Here are the details. First Sunday of every month....Cars and Coffee in Lake Mills, Wis., hosted by 2 Shores International. Park your Porsche among other great cars, buy a cup of coffee at the nearby cafe and enjoy some "kick the tires and talk time" with other car nuts. Starts early...7 a.m. and wraps up at 10 a.m. Set your alarm. Max and Rhonda Moser, transferred from Washington, D.C.
Richard Budowle joined the region in May with his 2013 Boxster sporting the color Mexico Blue. Its features include PDK, PASM, Sports Chrono and Paint To Sample (PTS) with interior trim Mexico Blue from the Porsche Exclusive Shop. It was a custom order and is his first Porsche. Richard is a nuclear engineer. 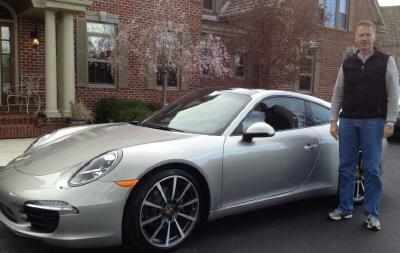 Marty Thomas drives into our region with his 2013 911 Carrera. It's Arctic Silver and features PDK, Chronos package, sport exhaust, Bose sound and a Panoramic sunroof. He bought it locally and it's his first Porsche. When he's not driving the 911, he's working as a senior vice president of operations and engineering services for a firm located in Milwaukee. Parade 2013 - Several region members attended PCA's annual Parade, held in late June/early July in Traverse City, Mich., on the western shore of Lake Michigan. Donna Daufenbach, Terry Royals and Al Wagner submitted reports and photos of the experience. Check out the stories here. June autocross pictures -- check out the photos from the June autocross, compliments of Hawk Photography. 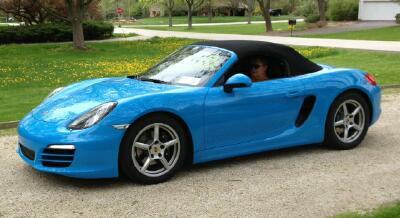 Zero emissions Porsche - check out the story here. Porsche at LeMans 2013...watch this video about Porsche's success at the recent LeMans and what truly matters. Max Hoffman Porsche showroom - Read about an important part of Porsche history in the U.S. here. 918 Spyder test drive -- Check it out here. Porsche delivers 15,000 vehicles worldwide in May, an increase of more than 12 percent compared with May 2012. Here are the stats. Thanks to Mike Wiviott, Jay Heppe, Ron Pace and Mike Jurkowski for these stories. Find something interesting on the web that others may have missed? Classifieds - Catch the latest classifieds here. Region member Dave Zimmer shared this photo of his and Lynn's grandson Dominic who obviously is following in grandpa's footsteps and will no doubt be driving and working on Porsches some day. Dave said this about the photo: "My grandson, Dominic, turned 1 year old and thinks he has all of the answers. He insisted I had a bad sway bar bushing. Son of a gun he was right. 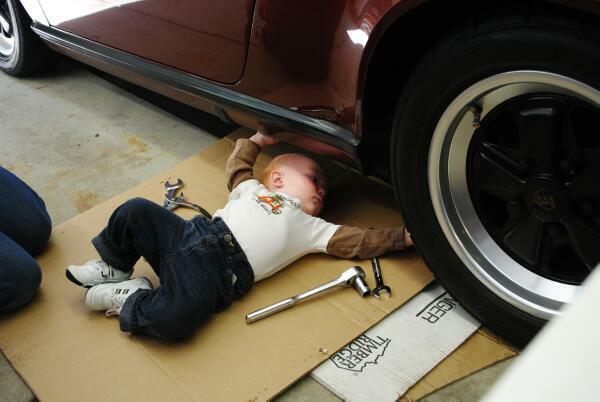 Ya gotta start them young."